TxDOT has long-range plans to widen all of Loop 1604 south of US 90 to a four-lane divided highway. One segment is under construction and two segments are in advanced planning. This page contains information about those projects. This project will widen Loop 1604 from a two-lane rural road to a four-lane divided highway from US 90 West to I-35 South. In general, the existing roadway will become the northbound lanes and a new southbound roadway will be built to the west. Additional overpasses for the new lanes will be built at the Medina River, Macdona-Lacoste Rd./Nelson Rd., and Quintana Rd. A new overpass and full interchange for Loop 1604 will be built at FM 2536/Old Pearsall Rd. At FM 143, a full crossover with turnarounds for both directions will be built. This intersection will be wide enough to accommodate a future overpass for Loop 1604. A turnaround-only crossover will be built just north of the Medina River at the location of a planned future east-west arterial. It will also be designed to accommodate a future overpass. At Macdona-Lacoste Rd./Nelson Rd., a second "jughandle" connector will be built on the west side of Loop 1604 to connect the new southbound lanes to Macdona-Lacoste Rd./Nelson Rd. 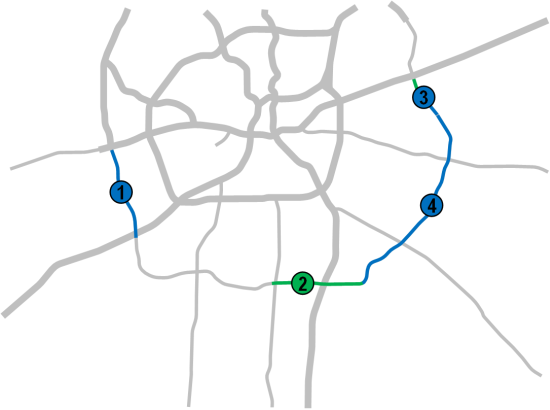 The existing connector will serve the northbound lanes. A turnaround-only crossover will be built at Kinney Rd. The Dragon Ln. connection to Loop 1604 will be closed and Dragon Ln. will dead end at the Southwest High School parking lot. A new connector road to Loop 1604 will be built just south of the existing Dragon Ln. At Quintana Rd., the existing connector to Loop 1604 south of Quintana will be removed and replaced with a short driveway to adjacent properties. This will also remove the existing railroad crossing there. The existing connector north of Quintana will be lengthened and reconfigured to become the entrance and exit ramp to/from southbound Loop 1604 and a new entrance ramp to northbound Loop 1604 from Quintana will be built. At I-35, TxDOT is currently exploring a possible double-roundabout or "dumbbell" interchange. Click on the image below to open the detailed schematic for this project from TxDOT with my own annotations added to help clarify and explain the various elements. The schematic will open in a new window that you can scroll and zoom. This project will widen Loop 1604 from a two-lane rural road to a four-lane divided highway from just west of US 281 to just north of FM 1303. Between US 281 and Cambellton Road, the existing roadway will become the eastbound lanes and a new westbound roadway will be built to the north of it. Between Cambellton and FM 1303, the existing roadway will become the westbound lanes and a new eastbound roadway will be built to the south of it. At US 281, a full diamond interchange (i.e. entrance and exit ramps from both directions of Loop 1604) will be constructed to replace the two "jughandle" connectors along with a new overpass for the westbound lanes. Turnaround-only crossovers (both directions) will be built just east of Rockport Rd., midway between Cambellton Rd. and Liedecke Rd., and just west of Labus Rd. Full crossovers with turnarounds will be built at FM 3499, FM 1937, Cambellton Rd., and FM 1303. A full crossover without turnarounds will be built at Priest Rd. An eastbound-to-westbound turnaround will be built midway between FM 3499 and FM 1937. At S Flores Rd. east of I-37, there will be a westbound left turn to S Flores and turnarounds for both directions but no left turn from S Flores. At Southside Heritage Elementary School, there will be an eastbound left turn into the school but no left turn out of the school. At I-37, there will be dedicated left turn lanes as well as turnarounds for both directions of Loop 1604. Projected start: Phase 1 should start in mid 2019. Phase 2 could start in late 2022. This project will widen Loop 1604 from a two-lane rural road to a four-lane divided highway from I-10 East to FM 1346. Due to funding constraints, however, this project will be broken into two phases. The first phase will run from I-10 East south to Martinez Creek and will start construction in mid 2019. The second phase, from Martinez Creek to FM 1346, is tentatively scheduled to start in late 2022. The descriptions and schematic below are for the entire project. Full intersections with dedicated right and left turn lanes will be provided at FM 1346 and at Schuwirth Rd. The intersection at FM 1346 will be signalized. The intersection at Green Rd. will be severed with each side becoming a "right-in/right-out" intersection. To turn left from Green Rd. onto 1604, or to continue straight through, will require a right turn and then a downstream U-turn. Midway between Green Rd. and Schuwirth Rd. Each turnaround will have both a deceleration and acceleration/merge lane. Other than the intersections and turnarounds noted above, there will be no crossovers along this stretch of Loop 1604. Traffic entering from driveways along this stretch will only be allowed to make a right turn. To turn left will require a right turn onto 1604 and then the use of a downstream turnaround. Between FM 1346 and Abbott Rd., the roadway will taper back to a two-lane rural road. On southbound Loop 1604 at Abbott Rd., there will be a dedicated left turn lane and a dedicated right turn lane. The existing left turn land on northbound Loop 1604 there will remain. A future project will continue the expansion south of FM 1346.